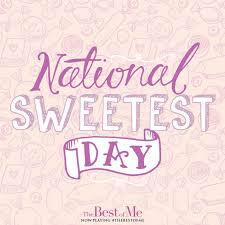 On National Sweetest Day, take care of all those who need care. Even those who need great care, when given the smallest token will feel the effects. A little treat, a card, a show of support during a time of need may be the sweetest gift on this day. By April of 1918, the United States officially entered the war in Europe and with that came rationing. Sugar, as well as many other commodities, became scarce. The holiday that was starting to see such success was shelved. Sweetest Day’s theme of charity and giving became apparent in 1921 when the Detroit Retail Confectioners, Detroit Wholesale Confections Club, Detroit Jobbing Confectioners Association and the Michigan Confectioners Club joined forces with the Red Cross to distribute thousands of bags of candy to hospitals, orphanages, shelters and homes across Michigan. The celebration also included 100 regulation army target balloons which dropped coupons worth a box of candy. < Commitment Where Is It?